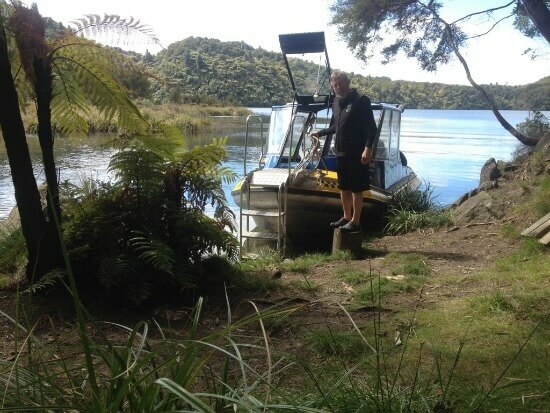 The popular Lake Tarawera Water Taxi provides transportation for Tarawera Trail walkers and Hot Water Beach campers, but that's not all it does. Eco Tours are an additional sideline with a number of sought-after tour options sure to delight visitors. Hot Water Beach hot spring waters bubble up through the sand. Can be extremely hot. 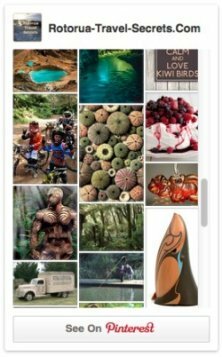 Options like getting the kinks out of your body when bathing lakeside or in a hot pool located in the bush, or stretching your legs with a riverside walk to view the Tarawera Falls. Nothing like Niagara Falls but impressive nevertheless. Can't wait? Jump down the page to the Eco Tours else read on to learn how best to utilise the taxi service. Getting to Lake Tarawera requires making your own way (no bus service) 20mins out of Rotorua to the Tarawera Trail Head & Car Park (secured at night), then a 15min walk to get to The Landing. Hot Water Beach Camping: From a transportation perspective, the only way to access Hot Water Beach is to hike in from the Trail Head (you can organise the Water Taxi to transport your gear if you don't want to carry it), take your own boat or use the water taxi. Once there you can pitch your tent or shake out your bedroll and sleep under the stars. Note that camping facilities are sparse. There's three toilets, a cooking shelter and that's about the extent of it. There's no running water and open fires aren't allowed. Cook your freshly caught trout and other food in the sandy bed of the lakeside where the hot thermal water bubbles up from below. 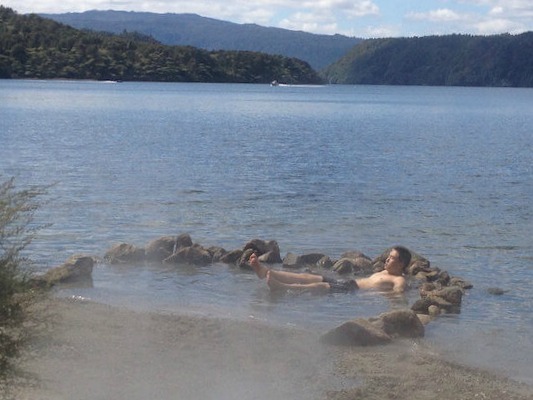 Tarawera Trail: For the Tarawera Trail walkers, Hot Water Beach is where the trail ends, or begins if you want to do it that way. Either way, the water taxi can drop you off or pick you up from the beach. Keep in mind that large backpacks will cost more to transport. There is a free shuttle to get you back to your vehicle after the 3:30pm pick up from Hot Water Beach. Camp-ground Cost: $13 per night for adults and $6.50 for children 5-17yrs. As above, under 5's are free. 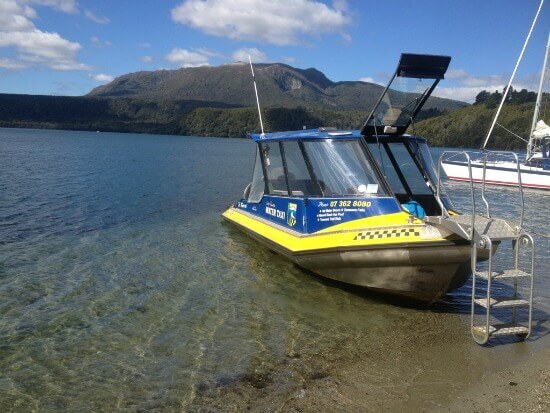 Book a Water Taxi at Totally Tarawera>> Make sure to scroll down the page to the booking button, the top one is for tours. On this, as on all the tours, prepare to be regaled with stories of the surrounding area by Dave, the owner of this business (or by whoever else might be in the skipper's seat at the time). I stowed away once and found myself highly entertained. With Dave's quirky, dry sense of humour, it was sometimes hard to differentiate between story and fact. Looking around at other faces, they too enjoyed hearing what he had to say and joined in readily with his friendly banter. That's the thing about most holidaymakers, they want a good time so it's not too hard a stretch. Anyway, the tour. With the imagination taking flight from stories about the Tarawera eruption, about the sites where his wife's family once lived, and about the mountain tipped to erupt next (spooky thought), it didn't take long for us to reach our destination. A short walk through overhanging manuka brush, 58 steps to be precise in Dave's words, we reached the natural hot pool. What a lovely setting. Once stripped off (have your swimwear on underneath your clothing - no changing rooms unless you count a brush screen) it's a few steps down into the beckoning waters of the shallow pool. Sinking back, all you can think is, "Ah, this is the life." Although other people were already in the pool, having arrived in their own boats, there was still plenty of room for us five newcomers. It didn't take long for friendly conversations to start up comparing the various countries represented and other topics of the day. Fun. There's nothing quite like sitting in a hot pool out in nature, especially when you can lift your head and also see the sun sparkling on the lake. It's elemental I guess. The bonus about this pool? There's no sulphur smell which really surprised me. And I still don't know how that one works. About twenty minutes later, we got the call that our time was up. This is about how long it takes to get to that stage where you begin wilting anyway so it was good to get out and changed. Heading back to the Lake Tarawera Water Taxi, it was a short ride following the shoreline to get to Hot Water Beach. Ten or so minutes is spent onshore checking out the thermal hot water bubbling in the lake and out through the fissures of a rock-face. It was interesting to see a camper with dinner wrapped in a plastic bag. 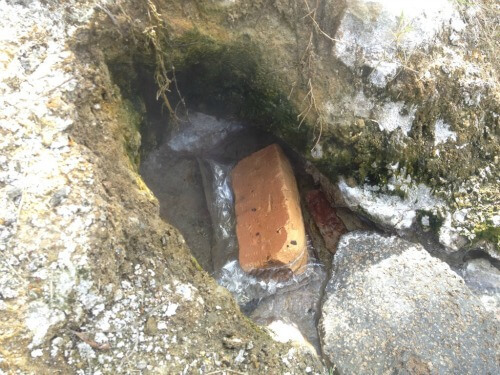 He placed it into a small pool of boiling hot water at the bottom of the rock-face where it was going to take a couple of hours to cook. Pity we couldn't stay to dine with him and his family. 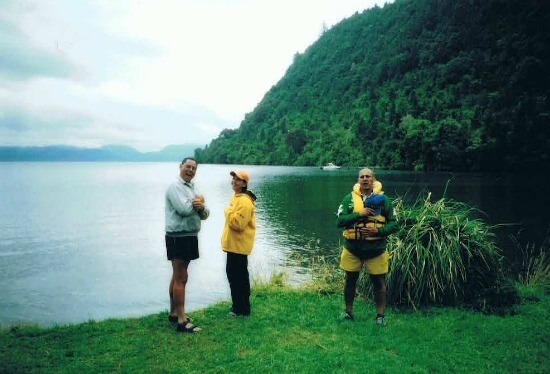 With our time up, we were joined by a young couple who had walked in on the Tarawera Trail. Our party made its way back across the lake to the Tarawera Landing where our brief but enjoyable tour ended and we farewelled our skipper, Captain Dave. A great tour. Take swimming gear and a towel, camera, some warm layers and maybe something to nibble and drink. 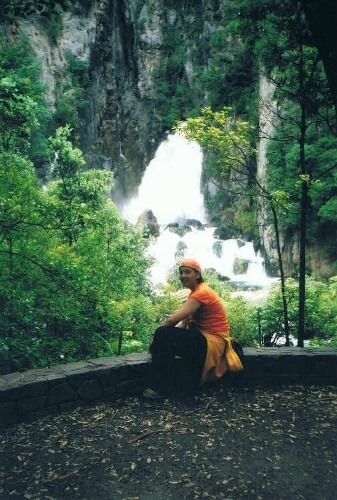 Tarawera Falls is a magical place to visit. I wouldn't call accessing it difficult but it does require effort in terms of planning and getting there outside of using the Lake Tarawera Water Taxi. This makes it less likely to be on bucket lists so no large crowds. 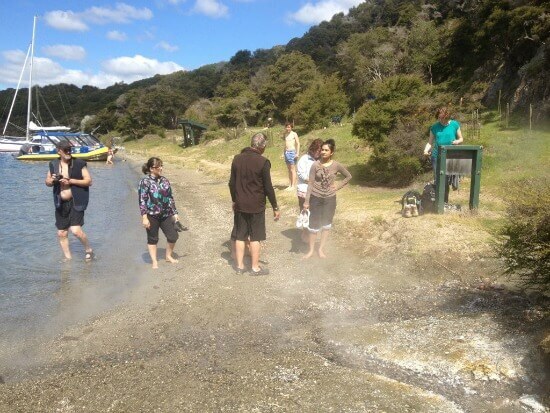 This time the Lake Tarawera Water Taxi takes you to a place called The Outlet, on the opposite side of the lake. There you will find another campsite - a popular place for school camps. It's accessed via the township of Kawerau and a 15km drive on forestry roads (rather rough I hear). 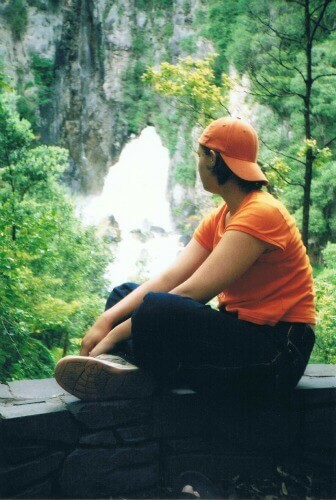 On reaching the Outlet you are dropped off, armed with a map giving directions to the falls and sent on your way. You'll find toilets at the outlet if required. 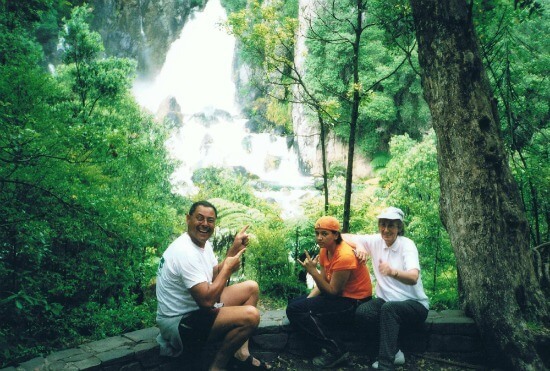 Moderate fitness is required as you walk alongside the Tarawera River to the falls. On the way, crystalline water laced at times with emerald greens then the bluest of blues makes it hard to not be impressed. 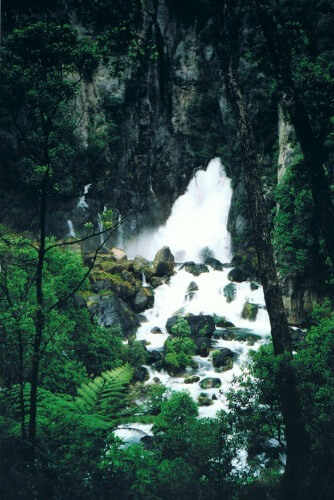 The Tarawera Falls adds a finishing touch of fey romanticism to the walk. Water gushes out of the lava rock fissures and rays of sunlight can be glimpsed dancing in the misty cloud of water vapour hanging in the air. Beautiful. At least, that's how it was when I visited a number of years ago. Take sunscreen, your lunch, a drink, good walking shoes, warm clothing, swimming gear if inclined, and of course your camera. A minimum of 2 adults is required for this tour. As above but with the addition of the Hot Water Beach visit and a dip in the wonderful hot pool in the natural bush setting. Again, take sunscreen, your lunch, a drink, good walking shoes, warm clothing, swimming gear, and of course your camera. 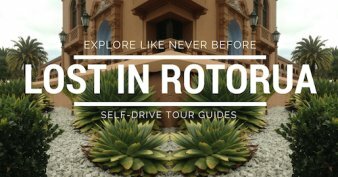 A minimum of 2 adults required for this tour. 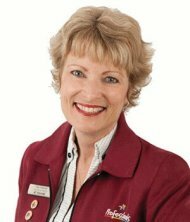 Address: The Landing (jetty), Tarawera Rd, Lake Tarawera - or The Mariners House (office) is just up the hill from The Landing. Limited presence over winter which is May to end of October. Self-drive - From the Information Centre in Rotorua, head south for a few blocks on Fenton St until you get to the major set of lights with the bright yellow Pak 'n' Save supermarket on one corner and McDonalds on another. Turn left and drive until you get to a large roundabout where the Redwood shopping centre can be seen on your right. Turn right onto Tarawera Rd and that's it. This road takes you all the way through to Lake Tarawera and the Landing (traditional name Punaromia) which is where the Lake Tarawera Water Taxi is located. Public Transport - Nil, Zip, Nada. The difficulty about getting to this place is the lack of public transport for those who need it. I've been told it's being worked on at this very moment (Oct 2015) so soon hopefully. In the meantime possibilities include having or hiring a bike and biking out (it has been done), or asking your accommodation provider if they know of anyone else going that way so you can catch a ride.